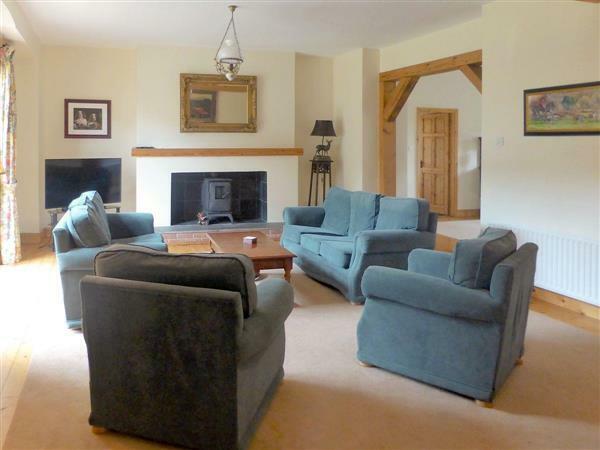 Hunters Lodge at Belline Estate in Piltown sleeps 8 people. Belline Estate in Piltown is set in 100 acres of rolling parkland, within the grounds of the 18th-century Belline House; these beautifully converted former coach houses are approached via a sweeping driveway and enjoy a stunning and unique setting for a truly memorable holiday. Spacious and elegantly furnished throughout, each offering cosy wood burners, gracious dining rooms, original features, including exposed stone walls, arched windows and beams. Both properties (refs W32333, W32334 [The Coach House]) also enjoy use of a shared large lawned garden, patio and grounds with their own lake. From each window there are spectacular views of the gardens and grounds which contain some interesting architectural follies. There are 40 acres of mature woodland, perfect for taking a walk without ever leaving the estate, as well as the owner’s donkey sanctuary. Holidaymakers can also bring their own horse with a livery available, at a cost. Outside of the estate, the village of Piltown, with an array of local amenities is nearby. Within easy access are the five counties of Kilkenny, Waterford, Tipperary, Carlow and Wexford, where you will find countless castles, abbeys and ancient settlements marking the Celtic, Norman and Anglo Saxondale times. The beach is 10 miles from Belline Estate in Piltown. With the shop, pub and restaurant 1¼ miles from Belline Estate. Hunter’s Lodge (ref UK32333) and The Coach House (ref UK32334) can be booked together to sleep up to 16 people. Approximate distance to Cork airport is 130 km. Hunters Lodge has a step to the entrance. Living room: With wood burner, Sky TV, CD player, wooden floor and French doors leading to garden. Dining room: With beams and wooden floor. Kitchen: With breakfast area, electric oven, electric hob, microwave, fridge/freezer, dishwasher and tiled floor. Bedroom 2: With king-size bed, beams and en-suite with shower cubicle and toilet. Bedroom 3: With king-size bed, beams and en-suite with shower cubicle and toilet. Bedroom 4: With king-size bed, beams and en-suite with shower cubicle and toilet. Logs for wood burner available locally. Both properties: Oil central heating, electricity, bed linen, towels and Wi-Fi included. Cot and highchair available on request. Welcome pack. Large lawned garden and enclosed patio with garden furniture and gas barbecue (shared with other property on-site). 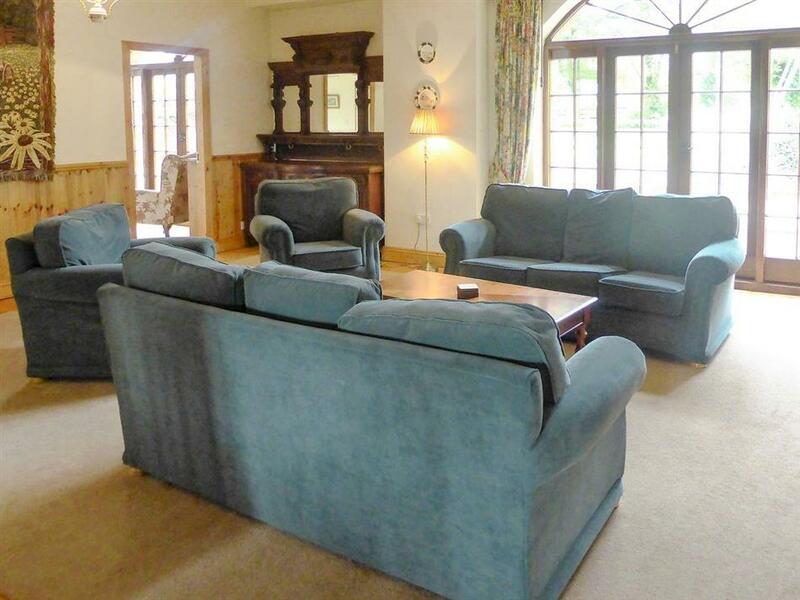 100-acre landscaped, natural grounds with woodland (shared with owner and other property on-site). Stabling and grazing for horses. Private parking for 3 cars. No smoking. Please note: There are unfenced lakes in the garden and grounds. Holidays at Hunters Lodge, Belline Estate run from Thursday to Thursday. For a better idea of where Belline Estate - Hunters Lodge is, you can see Belline Estate - Hunters Lodge on the map below. Do you want to holiday near Belline Estate - Hunters Lodge (W32333), you can see other cottages within 25 miles of Belline Estate - Hunters Lodge; have a look to find your perfect holiday location.